Have ordered these plants for the past three years. Each time reliable and good quality. This is a beautiful collection of Cosmos in all my favourite colours. I planted them in my 6 foot long trough and they shone until late October. The bees and butterflies loved them too. Like these as they make a statement, but are not too tall. Some cosmos get so tall (in my garden) that they need supports. These didn't and they flowered profusely throughout the summer. A bit prone to black fly, but that was soon dealt with. These plants did really well, with a very long flowering season. Don't plant them out until they are well established as slugs love them. Also bear in mind they are relatively short if you plant out in normal soil (although they'll get to 2ft tall in a well fertilised pot). Filled a large circular bed in my front garden with these mixed cosmos and they were a wonderful area of colour all summer, though they did not die very gracefully in the autumn! Beatiful long asting flowering period. I found them to be a bit leggy especially towards the end of the season which was October.That may have been because I didn`t plant them deep enough. I bought 60 plug plants, which are about 5cm to 7cm tall. Have their tops been pinched off, or do I need to do it. Delighted by the quality of the plants supplied. Yes, as the plants grow, you should pinch out the tips as this will encourage the development of bushier plants. 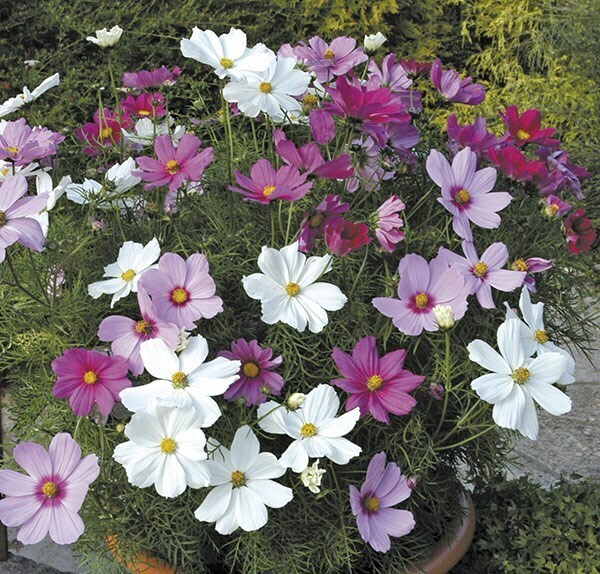 Hello I have heavy clay soil and thinking of planting them in a sunny spot, so would the Cosmos Sonata or Cosmos atrosanguineus grow well? Would I need to remove the Cosmos atrosanguineus every year from the ground and replant them in late spring? Thank you. 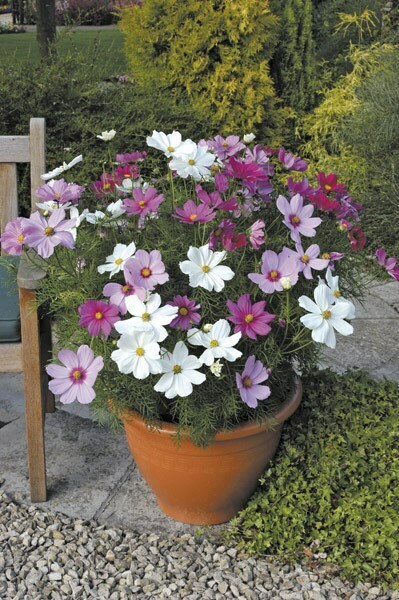 Hello, Both these cosmos like similar conditions, so if you have particularly heavy clay soil that remains heavy and wet for any length of time, then they may not be ideal unless you can improve the drainage. As for lifting the C. atrosanguineus, these are only half hardy, so unless it is grown in a very sheltered spot, it will ot survive the winter outside. If I buy the Cosmos collection - will it be clear which Plugs are which colour as I don't want to mix them - I want to isolate the white ones!! Hello there This cosmos is an annual bedding plant so will only last this year. These plug plants will give a wonderful display this year given the right conditions, but if you want plants to come back each year you need perennials. Cosmos atrosanguineus and Cosmos atrosanguineus Chocamocha = 'Thomocha' are half hardy perennials. http://www.crocus.co.uk/plants/_/cosmos-atrosanguineus/classid.2000010615/ http://www.crocus.co.uk/plants/_/cosmos-atrosanguineus-chocamocha--thomocha-pbr/classid.2000010616/ Hope this helps. Hello, do the growing tips of Cosmos Sonata need to be pinched out in the early stage of growth to make the plants bushy? Many thanks. Hello, They do not need to be pinched out, but if you do it will help create bushier plants. I've got some shallow beds in full sun at the front of my house... Will the fact that these are shallow beds be a problem for cosmos? And assuming not how far apart do they need to be planted so I can work out how many I need? Hello, Provided there is a good depth of soil these plants should thrive. I am not sure how wide your border is, but these plants have an eventual spread of around 30cm, so if it is narrower than that they may spill out over the path/lawn. As for planting distances, for a really strong display, I would plant them at 15cm intervals. 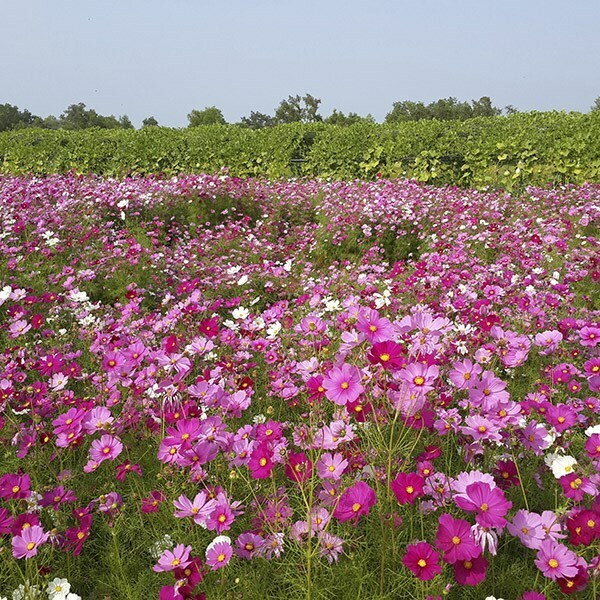 I want to give pots of cosmos as presents. please can you tell me how many of the plugs should I put in a 2litre pot. thank you. Hello, Eventually these plants grow to 60cm high by 30cm wide, so you could get away with just one per pot, however if you want the pot to look nice and full reasonably quickly, then I would opt for 3 or even 5 plugs in each 2-litre pot. 1) Given the current weather conditions and the fact that I only have a cold frame, would the cosmos plugs be OK in a cold frame for a while? 2) Please can you tell me the approximate height they grow to. Are they more suitable as 'back of border' plants? Thank you. Hello, These plants will grow to around 60cm tall, and as they are tender they do need to be grown in frost-free conditions. If your coldframe is in a warm, sheltered position, then they should be fine in there until the temperatures improve.